After the iPhone X, every phone will soon be bezel-less. What's next? After the iPhone X, every phone will soon be bezel-less. What’s next? The past year has seen wonderful advances in smartphone design – and more specifically, killing the bezel. The current wave began when Xiaomi announced the Mi Mix late last year, after which LG, Samsung, and Essential all took their own approach to maximizing screen real estate in 2017. Now there’s the iPhone X, and it’s the final nail in the coffin. Say what you will about Apple, but there’s no denying that the company has the most influence to define smartphone trends, even if it’s rarely the first to implement a feature. I’ve never bought an iPhone and I can admit to that. So what do designers do next? Though the original iPhone introduced the idea of a large (by 2007 standards) touchscreen, the bezel-less display truly became the holy grail of smartphones when Google and Samsung introduced the Galaxy Nexus in 2011. It was the first phone to feature virtual navigation buttons, which would in theory allow device makers to one day create a device with no bezel. The dream is ultimate efficiency – a phone with no wasted space. Since then, phones with little-to-no bezels pop up every so often, though usually as concepts at trade shows. Sharp beat most of today’s companies to the punch with its Aquos phone in 2014 (too bad it was pretty mediocre). The same company showed off a concept phone in 2016 with even smaller bezels. 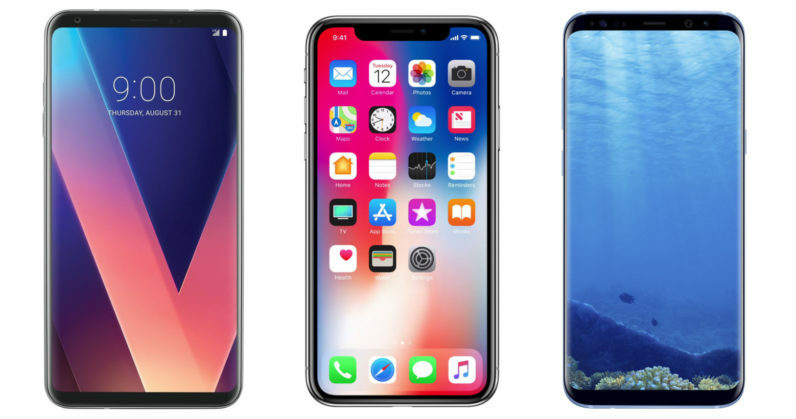 Though some have been initially hesitant to reduce bezels, with the iPhone entering the fray, you can expect every flagship to follow within the next year or two- and even some budget phones too. I mean, it’s hard not to look at something like the HTC U11, Moto Z2, or iPhone 8 next to the LG V30 without feeling like their designs are outdated, even if they are great devices in every other respect. Manufacturers will race to shave off another millimeter here or there, and eventually, someone will find a way to make the front camera and speaker array virtually undetectable, essentially turning our phones into one massive touchscreen. But as much as I can’t wait for this imminent bezel-free future, I’m even more excited for what comes after we’ve reached the limit. Left to right: Essential PH-1, HTC U11, LG V30. The U11 is a great phone, but has a smaller screen despite physically being the largest of the three phones. After years of trying to fill handheld rectangles with the biggest screens possible, designers will have to, *ahem*, think outside the box. Phones will try to differentiate themselves with new materials and features at first, but we spend most of our time looking at our screens. It’s too important a feature to remain stagnant. As such smartphone displays will have to evolve. And we know manufacturers are already working on it. One idea is simply using the back of our phones, which some manufacturers have already tried. The Yotaphone series puts a handy e-ink display on the back of devices, giving you a low-power screen that’s great for reading without draining battery. Meizu put smaller OLED screen on the back of its flagship Pro 7, which can serve up notifications or help you use the rear camera for high quality selfies. Flexible screens make common appearances at tech trade shows – even if manufacturers haven’t quite found a real use for them in smartphones. Lenovo showed off a couple of concept devices using the tech last year, including a wrist-band device and a phone that expanded into a tablet when unfolded. That second idea seems likely to catch-on once the technical difficulties are ironed out; it would be an easy way for manufacturers to continue the trend of fitting larger screens into handheld devices. You could, say, read Facebook in ‘smartphone’ mode, but then unfold the device to do some serious work or watch videos in tablet mode. It’s possible Microsoft will take that approach with the Surface Phone, if patents are anything to go by, and there are some early rumblings Samsung is considering the same for a future Note phone. Perhaps phone makers will realize that handhelds can only take us so far, and it’s time to invest more strongly in more dramatically different form factors. VR and AR headsets seem likely candidates. They are still too bulky to be mainstream, but it’s only a matter of time that they’ll become as small as a pair of glasses, according to Mark Zuckerberg. Or maybe the future of the smartphone belongs to a completely new category of device altogether. Whatever the case, it’s going to be a fun ride – what do you think comes next? Note: This post was originally published on July 27. It has been tweaked and re-shared to reflect the announcement of the iPhone X and other devices.